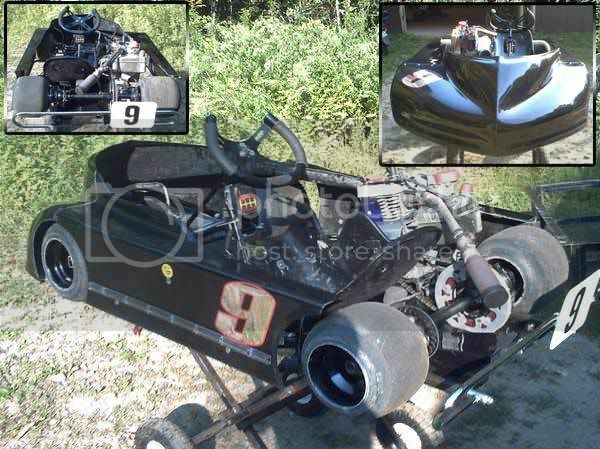 We race exclusively with limited-modified 5hp Briggs and Stratton flat-head motors all with affordable 100% stock parts. Kyle posing with the Galletta's Greenhouse #5 at the 2007 Galletta's Klassic (9/23/2007), his final Galletta's race. Galletta's #5, #0, #1, Kelly Miller/Kyle Super-9. Driven other Galletta's rentals. 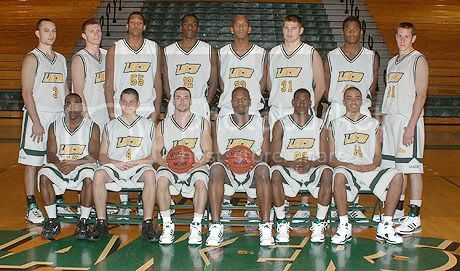 2006-2007 (Technically one full season). 2010. Galletta's officials and racers love Kyle and wish he'd come to race at least occasionally -- or for at the very least, the Annual Galletta's Greenhouse Karting Klassic 200 -- but Kyle races other forms of race cars (WKA flatkarts and is hopeful Supermodified racer), so we understand if he can't make it for more than the occasional race. Kyle has raced different types of cars (including quarter-midgets) semi-professionally before and holds countless wins and many track records. 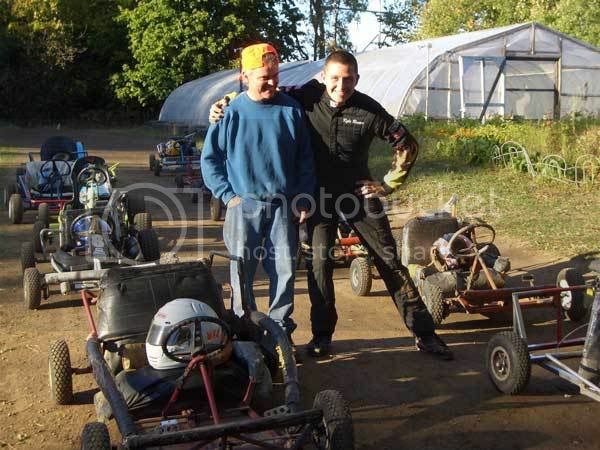 He also has dominated the Oswego Kartway methanol karting division in their premiere class between late 2007 and 2010. As for Galletta's, Kyle started doing well in his 2nd race at the track, when he won a rain-shortened race in Fall 2006. 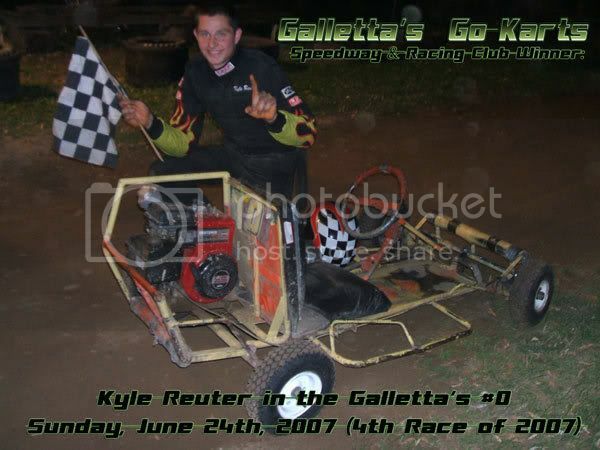 In 2007, Kyle also did very well, as he was one of the top-runners all season at Galletta's, getting some impressive wins with some VERY talented racing fields - that particular year probably had the most racing talent in one single class in the history of Oswego County dirt karting, as several have raced in many types of race cars, not just karts. In his only one season of racing at Galletta's, Kyle amassed one of the highest points-per-race, total wins and win percentages of all visiting drivers, proving his skills as a racer and proving wrong the terrible drivers who tried our karts out and thought we rigged them. We do not. If you can drive, you can win. Kyle proved that. He also explained before the 2007 Klassic that, "it is not easy to win at Galletta's, no matter what anybody else believes." There is too much talent, too big of a track, and too many laps to get an 'easy' win. Kyle Reuter winning a feature on 6/24/2007 in the Galletta's #0. 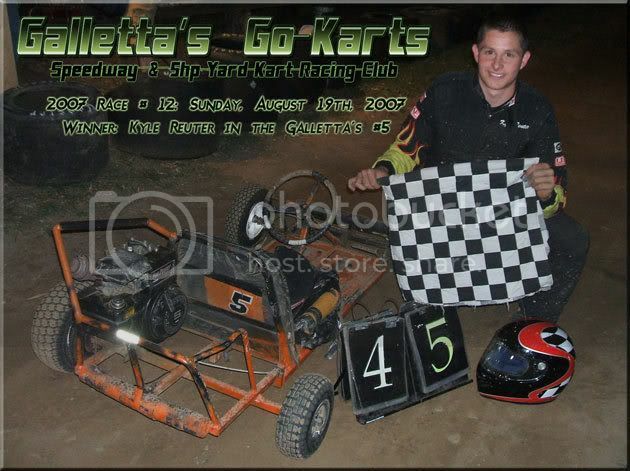 Kyle Reuter wins a competitive 15-kart, 45-Lap feature on 8/19/2007, this time in the Galletta's #5. Kyle took a few seasons off at Galletta's to concentrate on his methanol flatkart, but returned in 2010 to race the 15th Annual Galletta's Klassic 200. 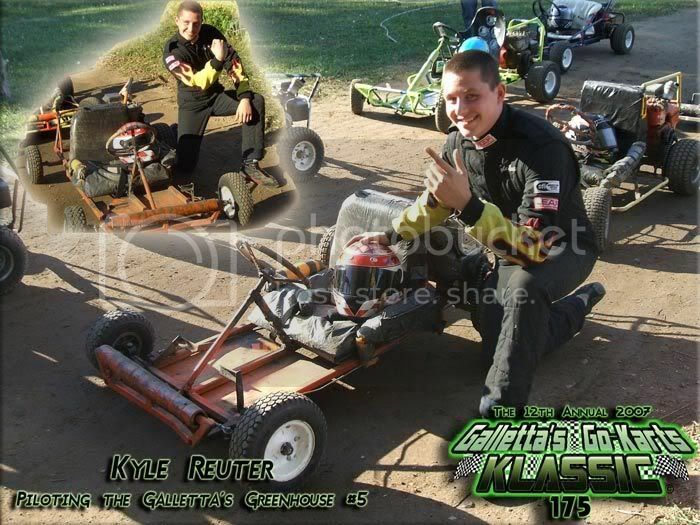 Kyle Reuter becomes the 1st driver other than the Galletta's Karting Club Founders -- Matt Stevens (10 Wins from 1996, 1997, 1998, 2002, 2003, 2004, 2005, 2007, 2008 and 2009), Chris Stevens (3 Wins from 1999, 2000 and 2001) and Wes Stevens (1 Win from 2006) -- to win the Galletta's Greenhouse Karting Klassic 200 Lap race. In addition, he also became the 1st driver to come back from the rear using a back-up kart to win (started the race with the Galletta's #1 kart and finished the race in the Galletta's #0 kart), and the 1st driver to ever win a Klassic with the Galletta's #0 9it got as high as 2nd in 2007 and 2003, but went un-used some years. Kyle flipping badly on 7/8/2007. Don't try this at home, kids! Kyle flipping again on 8/12/2007 (making Ogre cry). Poor Kyle is either fast or flipping! 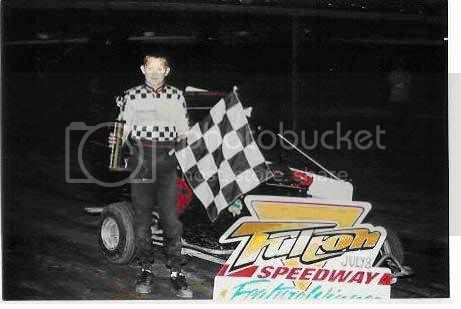 Kyle winning races as a 13-year old youngster at Fulton Speedway. Kyle has so many wins and track records, he lost track of them all. Kyle's new 2007 methanol kart. Currently the only driver with the talent to run in both methanol kart and gas Supermodified yard kart classes. Kyle trying a modified at Thompson Speedway. Kyle gettin' some lovin' from Ogre before the 2007 Galletta's Klassic. Racing is not Kyle's only sports talent. He was also a sharp-shooting guard for the SUNY Oswego men's basketball team, and is generally known as the only Galletta's Club driver whose game is accepted in the 'hood. Kyle posing next to the Galletta's/Pigsley #10 for the Galletta's Klassic 150 on 2006/09/23 - his 1st race at Galletta's Backyard Karting Speedway. Sheesh, he looked like he was 16!